This was a test run of the Nordik artwork on No Jive halves. We wanted to do a complete run of these, but proper centering of the hex was extremely difficult. Not all came out as well centered as this one. Still, a beautiful example of a No Jive Mandala, and one of my favorites with a Nordik design from Oke Rosgana. Bifrost and Nordik designs were an attempt to do Viking style art. Fused with the Celtic influence and with Runic Alphabet. 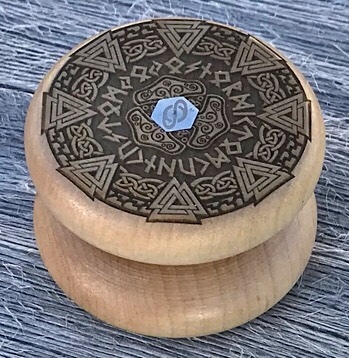 The text reads "Tom Kuhn Custom Yoyos Nordik" in Viking runes. Only about 12 of these were made as part of the test run in the butterfly configuration. One of my favorite Mandalas.